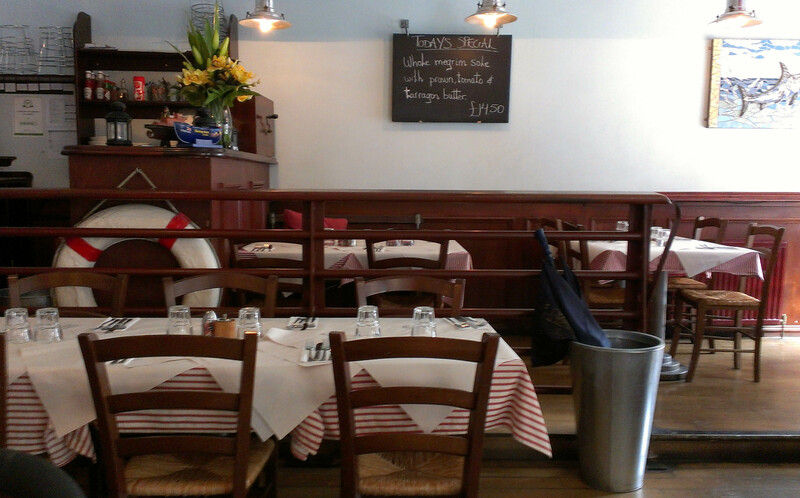 The Baberoo’s Gran took us out for lunch this week at Fishers Restaurant (36/37 St Clements Street, OX4 1AB). Oxford is a landlocked city so it’s not the first place you’d think of for a fish restaurant, but Fishers has its own carriage company which delivers fish from Cornwall on the day of catch. The lunch and early evening menu is served from 12-2:30 and 6-7 pm every day of the week and is £8.95 for two courses or £11.50 for three, which is cheap as chips (or should I say fish and chips?). I had two courses because I can never manage three, although I wished I could have because the starters looked lovely. My mother-in-law enjoyed her starter of crispy squid with roasted garlic mayonnaise. 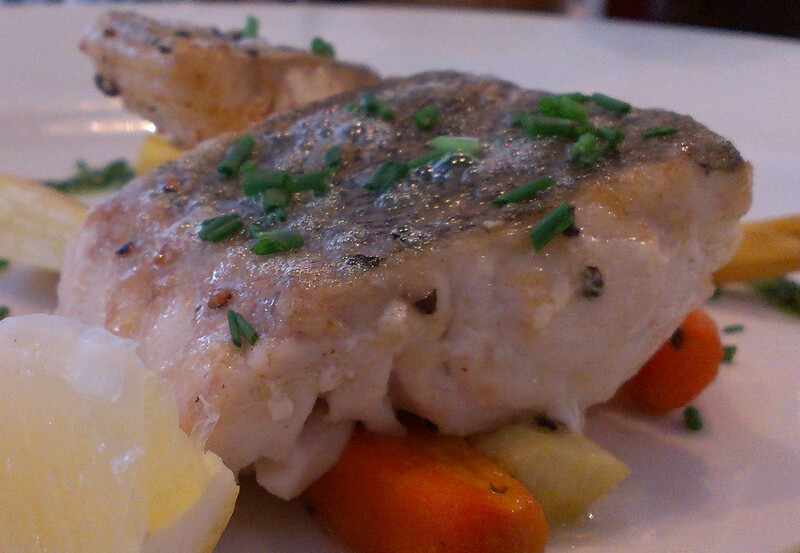 For our mains we both ordered the hake fillet with roasted root vegetables and basil pesto. The fish was succulent and moist and paired well with the pesto. My choice for dessert was the sticky toffee pudding with butterscotch sauce. 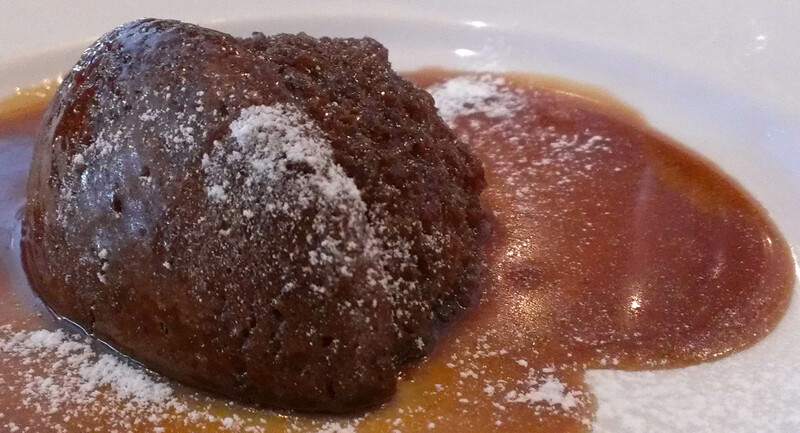 The pudding was light and spongy, all the better with which to soak up the deliciously sticky sauce. I thoroughly enjoyed my meal and would certainly go back again. Menu: The lunch and early evening menu has three options for each course; it’s a constantly changing menu so there’s no guarantee of which dishes you’ll get to choose from, but the starters and desserts on the day we went would all have been easy to eat with one hand while holding a baby in the other arm. One of the mains will always be fish, so it’s likely that it can be eaten using only one hand as well. Other mains may include a seafood or meat dish that might not be as easily eaten with one hand. But given the tight menu, it’s got quite a lot to choose from with regards to ease of eating while holding a baby. Space: One of the reasons I’d never ventured into Fishers before was because of the revolving door. I needn’t have worried, because as soon as they saw me trying to get in the staff were very helpful and pushed the door slowly so I could navigate the space. Even my very large baby carriage fit through just fine, although there wouldn’t be enough space for a twin pushchair. The interior of the restaurant has plenty of tables with regular chairs and bench seating; there’s enough space in most areas to put a pram at a table, although I don’t think a group of parents with baby carriages would be able to fit comfortably. Ambiance: Cheerily nautical: fishing ropes, lifebuoys, nets, and other fish-related paraphernalia adorn the restaurant; the kitchen even has portholes for windows. The staff were extremely helpful and friendly with the Baberoo and service was top-notch. We were offered the choice of two different kinds of high chairs and the Baberoo enjoyed sitting in hers and ripping up the paper tablecloth covers. There are also crayons available so toddlers and older children can amuse themselves. Facilities: Fishers doesn’t have any baby-changing facilities, but staff did offer me a space on a bench to change the Baberoo (although we waited until we got home). They are currently looking into installing a changing table in one of the bathrooms, but – as with many Oxford buildings of a certain age – the toilets are extremely small and there aren’t many changing tables that can fit into the space. Still, it’s great that they are looking into it. 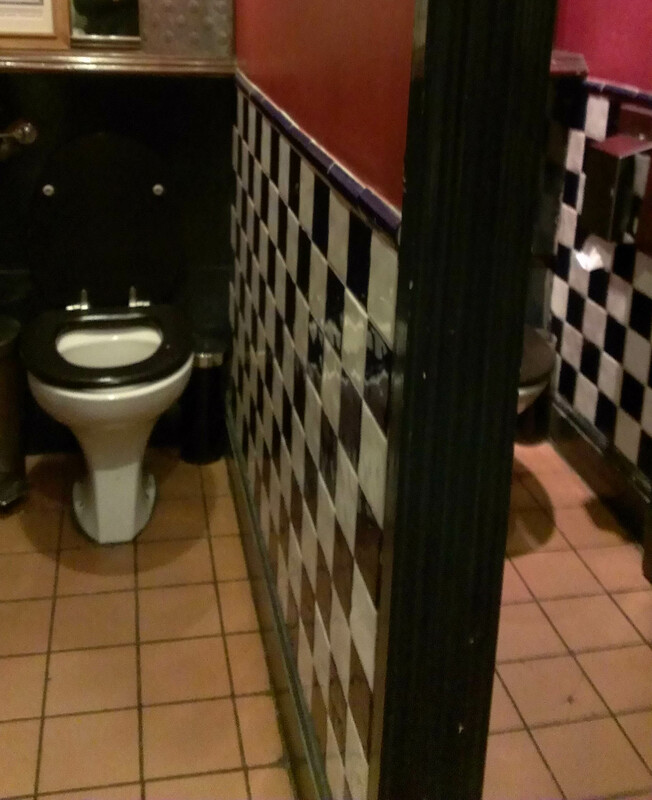 If they manage to find one that fits into the space, you still won’t be able to bring your baby carriage in with you because of the size of the entry to the toilets, so you’ll have to leave it at your table. Feeding: The Baberoo ate a meal sitting in her high chair and had a whale of a time throwing oatcakes and peaches on the floor. If I had wanted to breastfeed her I would have been able to choose between a regular chair or a bench. Both would have been fine, although they are unpadded so they wouldn’t be as comfortable as in some other places. Fishers Restaurant scores a 6.75 out of 10 for baby-friendliness and would have scored higher if they’d had baby-changing facilities. This number is no reflection on the food, which I rate much more highly. If you are a fish lover this is a great place to visit, and the lunch deal simply can’t be beat.